TestFont_WPF is a C# project written in the .NET 3 framework that demonstrates the integration of the ConnectCode dynamic link library. The source code for TestFont_WPF is provided in the download below and requires Visual Studio 2005 or later to compile. The following is a screenshot of the sample in Vista. Dowload the TestFont_WPF.zip executable and source code. 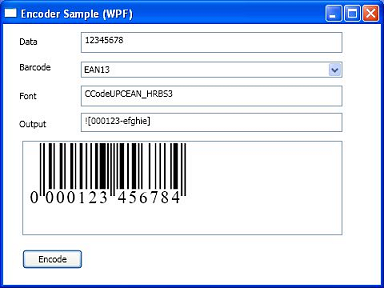 The ConnectCode Barcode Fonts DLL and the source for the TestFont_WPF sample are free to use and can be compiled and distributed with users' applications as long as they are being used with any one of the registered barcode font packs. Redistribution of ConnectCode's fonts will, however, require a Distribution or Unlimited Distribution License. The following needs to be installed on the user's machine for successful compilation and execution. 2) Copy the DLLImport statements for connectcodefont.dll into your project. The result will be stored in the outputstr variable. The TestFont_WPF sample includes all the above steps in a short and easy to understand program. Note that the barcodes generated with the Trial version of ConnectCode Font Pack will have horizontal lines across them.